With the recent release of VMware vSphere 6.5, there is a wide array of new enhancements and features that round out this version of vSphere. Notably, major improvements to the vCenter Server Appliance or VCSA which confirms the direction by VMware of moving forward as a platform with the VCSA appliance and not the Windows Server version. Aside from the enhancements with the VCSA appliance, there are improvements across the board in cluster resource management such as High Availability (HA), Distributed Resource Scheduling (DRS), and Fault Tolerance (FT). Integrated Update Manager – This has long been a reason why many have remained with the Windows version of the vCenter implementation. 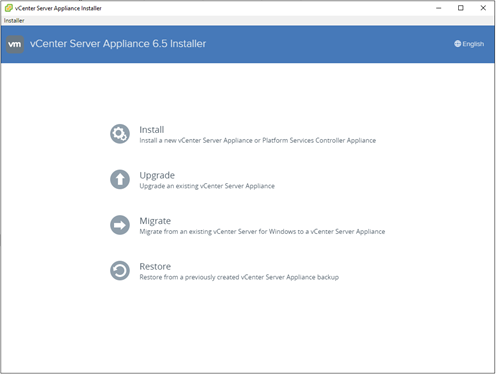 Now with the release of version 6.5, this is no longer a limitation of deploying the appliance version of vCenter as opposed to Windows. New backup and recovery procedure – Before it was cumbersome to backup the vCenter appliance. Now the VCSA 6.5 appliance has a native backup and restore mechanism that is file based, making backups and recovery much easier. Built-in High Availability or HA – Prior to the HA enhancements in 6.5, VCSA installs had to rely on cluster HA, fault tolerance in version 6.0, or a paid product from VMware called vCenter Server Heartbeat (now end of life). 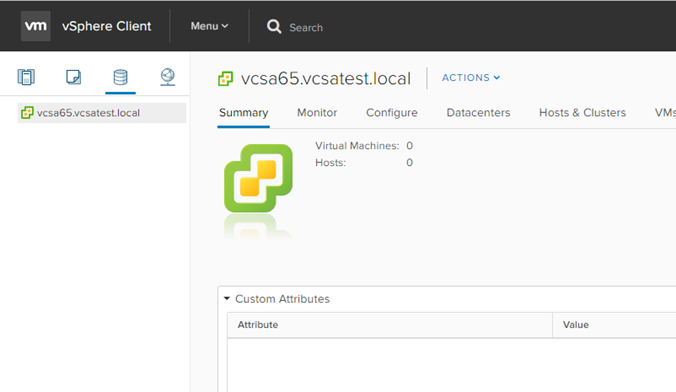 The enhanced HA functionality is now inherent to VCSA 6.5 utilizing an active vCenter appliance, a passive vCenter appliance and a Witness passive node. Better performance across the board with the new appliance largely due to running on the new Photon OS. HTML5 interface has been released with VCSA 6.5. The new interface is replacing the “long in the tooth” “fat” client that many if not most have used in version 6.0 and earlier. ***Note*** – At least in the GA release of 6.5, the HTML5 interface is only partially functional, meaning you still have to utilize the flash based Web UI. Also, improved in the VCSA 6.5 release is the vCenter Server Appliance Management interface, formerly known as VAMI, has had a much needed overhaul. The new management interface provides much better health statistics and metrics for monitoring the VCSA appliance itself including CPU and Memory historical data as well as database historics/metrics. Backups and syslogging can be setup within this new interface. There is now support for encryption at the VM level in version 6.5. This tightens up security at the VM level as before someone could simply copy VMDKs, take them home, and mount to their own VMware or other environment and boot the VM. Now the encrypted VMs are tied to a key server which makes the VM unreadable outside of the valid environment. To go along with the encrypted VM feature, encrypted vMotion keeps the VM data secure as compute resources are changed for an encrypted VM during the vMotion process. High Availability has been improved with 6.5 – Restart priorities have been added to allow for priority enforcement. Also, restarts can now be orchestrated bringing certain VMs or dependencies online before others. Perhaps the coolest new feature here with HA is the proactive HA that can monitor hardware for faults and proactively move VMs off an ailing host. DRS is now network savvy in that it can calculate bandwidth into DRS and take this into consideration to avoid oversubscription. Fault Tolerance is seeing a much-needed performance improvement in this release due to link aggregation as well as kernel improvements. Notably with the VSAN standard license you get the all flash option meaning anyone can have access to the all flash configuration unlike before where you needed the VSAN Advanced license. VSAN iSCSI service – provides the ability to create iSCSI targets and LUNs and expose them. There are now new REST APIs for full VM management which increases the power that administrators have over their environments and the automation that can be leveraged. PowerCLI is fully module based now with many improvements across the board. With the new features of vSphere 6.5, VMware has certainly upped their game in features and functionality. The new version of vSphere shows that VMware is serious about improving performance, making the user experience better, improving on security concerns in the virtualized space, and making the transformation to the hybrid cloud a seamless experience. With the native features that are now part of the new VCSA appliance, you can easily make the transition from the Windows platform of vCenter to the Photon OS based appliance. VMware has really tightened up the gaps that have existed in the areas of VCSA appliance backups, high availability, and monitoring. They have also listened to administrators on the deployment process as well as the user interface. Getting away from the browser plugin based deployment and going with a standalone installer was a smart move. Also, as the HTML5 interface matures starting in vSphere 6.5, we can truly make the transition away from the Windows vSphere Client that most still prefer to use over the flash based Web UI. One unfortunate thing however, as we noted above, the HTML5 interface is still not fully functional, so you will still have to use the Web UI for configuration as the Windows vSphere Client has been fully deprecated and no longer works connecting to vCenter 6.5. With the new APIs and PowerCLI functionality there is virtually nothing that can’t be automated or fully control via scripting or custom API interfaces. The new REST API explorer is another great edition to vCenter server itself. One thing is for certain, this is an exciting upgrade worthy release packed full of goodies from VMware. We can only wait and see what U2 of version 6.5 will offer when that time comes.